Three 3D printing stocks have been taken to the woodshed. Here are two ways to profit from their sell-offs. Once hot, 3D printing stocks are now...not. Over the past five years, 3D printing companies Stratasys (NASDAQ:SSYS), 3D Systems (NYSE:DDD), and ExOne (NASDAQ:XONE) took investors on a round-trip ticket from initial lows, to exhilarating highs, and back to lows again. SSYS, DDD, and XONE Data by YCharts. 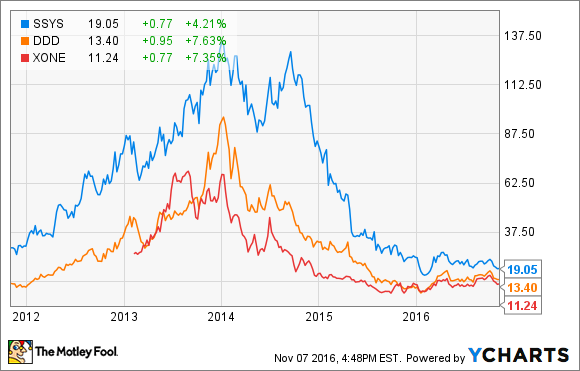 Despite their remarkable gains mid-decade, these three 3D printing stocks have squandered their momentum. They've returned to about where they started five years ago and left investors no richer for making the trip. But don't lose heart. After digging around, there are a couple of unconventional 3D printing stocks that might do a bit better for you. A few things jump out in the chart up above -- most notably, the big differences between the companies themselves. HP Inc. (NYSE:HPQ), which is the company you probably still think of as "Hewlett-Packard," is primarily a purveyor of personal computers, printers (the ones that print two-dimensionally, on paper), and the ink needed to do that printing. Recently, HP began expanding into the third dimension, offering a 3D printing technology dubbed "voxel" through a line of high-end printers it calls "HP Multi Jet Fusion." But at present, this business accounts for just a small sliver of HP's nearly $100 billion-a-year annual revenue stream. Contrast that with Proto Labs (NYSE:PRLB), a much smaller company, at just $1.2 billion in market capitalization and less than $300 million in sales. In contrast to HP, which sells hardware, Proto Labs uses other companies' hardware (i.e., 3D printers) to custom-print parts for engineers and developers needing short production runs. Technology-agnostic, Proto Labs offers a way to invest in the concept of 3D printing without taking on the risk of choosing the "wrong" 3D printer maker to invest in. Valuation: Which is the better buy? Choosing one or the other of these 3D printing companies to invest in depends somewhat on your risk tolerance. On the low-risk side, HP Inc is a huge business, and at this point in time, not at all dependent on the success of its 3D printing products to make or break the company. Rather, 3D printing is a major potential growth driver that has time to mature and develop under the boarder HP business. Currently, analysts quoted on S&P Global Market Intelligence expect no more than 1.2% annualized earnings growth from HP Inc., which helps to explain why investors are valuing the stock at less than eight times earnings. If its Multi Jet Fusion printers take off, they have the potential to juice HP's growth rate and increase the stock's valuation. On the other hand, if 3D printing turns out to be a bad business for HP -- or even if the company just loses interest in the concept again, as happened when it cut its ties with early partner Stratasys back in 2012, buyers of HP stock can take comfort in the fact that they still own a stock that pays a 4.7% dividend yield, carries little debt relative to its cash reserves, and is producing $3.9 billion in annual free cash flow. More aggressive investors might be more inclined toward Proto Labs. The company pays no dividend and sells for a much fatter earnings multiple than does HP. On the other hand, most analysts who track Proto Labs forecast 20% long-term earnings growth for the stock, while at least one believes the stock could grow as fast as 30% over the next five years. If they're right about that rate, the stock's 26 P/E ratio could be a lot cheaper than it looks.